'To travel so far and see so little.' Visiting the old country without looking at a castle was tantamount to dining at Pizza Hut and passing on the pepperoni. Dreading this scene, I intended to get our dose of medieval masonry out of the way as quickly as possible. Since we were in Dublin, I made what I thought was the obvious choice in planning a visit to Dublin Castle, seat of British rule in Ireland until 1922. The problem was, when we got there, we didn’t see any castle. When Americans think of castles, it’s really only one castle we’re thinking of - the King Arthur job with the moat and drawbridge and towers. 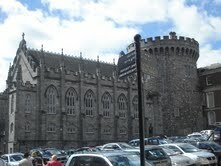 Dublin Castle, unfortunately, looks nothing like Camelot. The main court is mostly neoclassical, with pediments, columns and other Greek accoutrements. AUNT (flipping through a photo album very quickly, on a mission): So, where are the castles? Didn’t you see any castles? TRAVELER (pretending the question was unexpected): Castles? AUNT: You were in Europe, weren’t you? TRAVELER: Well, I’d have to say Dublin Castle was the most impressive. Wouldn’t you, Mother? TRAVELER’S MOTHER: Oh, yes. Dublin Castle was amazing. AUNT (dropping a nacho between the pages of the photo album): Dublin Castle? You must be mistaken. Dublin Castle isn’t really a castle at all. It’s a Georgian edifice, constructed in the early 18th century. AUNT: The “castle” in Dublin Castle refers primarily to the Norman fortification that previously existed on the same site and burned to the ground on April 7, 1684. Of the original medieval structure only a single tower remains. So, we’ve determined that you saw a medieval tower in Europe. Now, I’ll ask again: where are the castles? Oh, and do you have any more of that spicy salsa? Since Mother and I are the only members of our immediate family to possess passports, this scenario seemed unlikely. A snapshot of the authentically medieval Record Tower, with a caption reading “Dublin Castle,” would probably have been sufficient to satisfy any castle-inquiring relatives, but, as our time in Dublin drew to a close, Mother became concerned. So we decided to shoot up the coast to the village of Malahide, where we were assured we’d find a feudal fortification that would impress even the most discerning of American castle connoisseurs. 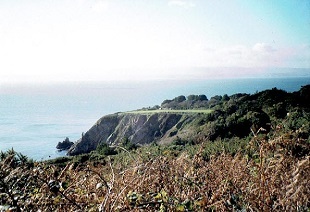 The bus ride along Dublin Bay to the peninsula of Howth Head was a pleasant change from city life. The salt air was bracing, and the view from the cliffs resembled the Ireland of storybooks. A strange yellow orb glowed in the sky above us. “Is that the sun?” said Mother. At Howth harbor, fishing boats clattered in their slips, and seagulls dove at the sparkling water. The sun’s reflection seemed to dazzle them, and they came up woozy and fishless. By the time we got to Malahide Castle, the sun had overstayed its welcome. Old ladies strolling the grounds opened their umbrellas against its golden rays, while dog walkers and their canine charges sought refuge under centuries-old oak and chestnut trees. The castle itself seemed discomfited, cringing behind its ivy cloak. Malahide is a fine old castle with several crenellated towers of varying height and a couple waving pennants for added medieval flair. It’s no ruin, either. The Talbot family maintained it as a private residence for some eight hundred years, so it has electricity and heating and all the comforts of modern living. As this was Halloween day, several villagers were dispersed about the property in costume. We encountered a witch smoking a cigarette behind the shrubbery, and Mother got her camera out. “Do you mind?” she said. The castle guide was full of ghost stories, as all castle guides are. She seemed particularly thrilled to be telling them on Halloween, when people are actually interested in such things. Her favorite piece of spectral lore involved a small door in the Great Hall, reserved for use by one “Mr. Puck,” a deceased caretaker who is said to make an appearance whenever the castle décor is changed. Mr. Puck apparently prefers the Great Hall because it’s the only room to have survived the large-scale remodeling efforts of the Baroque and Georgian periods. 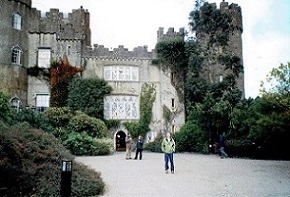 In fact, it’s the only medieval hall still in use in Ireland today. Much creepier than a ghost whose source of eternal torment is interior decorating is the large, dusky canvas depicting the Battle of the Boyne that hangs over the table. On July 1, 1690, after taking breakfast together in the Great Hall, fourteen Talbot men rode off to the Boyne to fight for King James. None returned. As we were leaving the castle, Mother snapped a parting shot of the arched gateway and its spiked portcullis. “Operation Irish Castle complete,” I said. Dan Morey is a freelance writer in Erie, PA. He’s worked as a book critic, nightlife columnist and outdoor journalist, and has traveled extensively on every continent except Antarctica, which he’s in no hurry to visit. Find him at danmorey.weebly.com.